The government deficit, public service cuts and unemployment have been the focus of an election event in the Brighton Kemptown constituency. 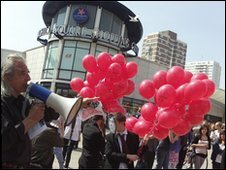 Trade Unionist and Socialist Coalition candidate Dave Hill released 168 balloons, each one representing £1bn. He said ordinary working class people should not be paying for the deficit. The Conservatives, Labour and the Liberal Democrats all agree on the need to radically reduce the deficit with spending cuts, rather than tax rises. Labour's parliamentary candidate for Brighton Kemptown, Simon Burgess, has said he believes investing in public services has been, and will continue to be, a vital part of beating off recession. Conservative candidate Simon Kirby said a government led by David Cameron would "usher in the change the country so desperately needs". "There is a clear choice in Kemptown between a failing government led by Gordon Brown and five more years of Labour, or a fresh start under David Cameron." Liberal Democrat candidate Juliet Williams is campaigning to bring the budget back under control, and for fair taxes that put money back in people's pockets. Candidates announced for Brighton Kemptown are: Labour: Simon Burgess; UK Independence Party: James Chamberlain-Webber; Green: Ben Duncan; Trade Unionist and Socialist Coalition: Dave Hill; Conservative: Simon Kirby; Liberal Democrat: Juliet Williams.